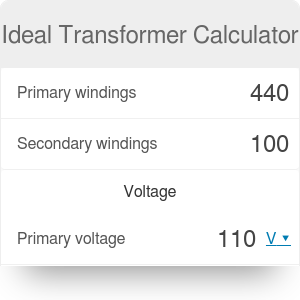 The Ideal Transformer Calculator is an easy tool that helps with a question: how does a transformer work? Have you ever wondered how the electric current from the high voltage power lines turns into a familiar 110 (or 220V) in the outlet socket? That's what electric transformers do. The text below explains the workings of transformers. By reading it, you will also learn about special types of transformers such as a current transformer and a voltage transformer. A transformer is essentially just two coils, primary and secondary, that are placed next to each other. The AC current running through the primary coil creates a varying magnetic field. This magnetic field induces a voltage difference, an electromotive force, in the secondary coil. You can learn more about the inductance checking the solenoid inductance calculator. Coming back to the transformer, essentially the magnetic field transfers the energy from one circuit to the other. If you're surprised that magnetic field can transfer energy, you might check the energy density of fields calculator. In an idealized picture, we disregard all potential losses and assume that all the magnetic field from the primary coil passes through the secondary coil. Then the only thing that matters is the ratio of the number of windings between the primary and secondary coil. This is because the strength of the magnetic field depends on the number of windings in the primary coil. The number of windings in the secondary coil determines the strength of the electromotive force. Ip [A] is the current at the primary coil. P = Ip * Vp = Is * Vs. This is a sign of the conservation of energy. In a real transformer, due to losses, the power at the secondary coil will always be smaller than the power at the primary coil. Current transformers are used to provide a precise measurement of the current. In current transformers, there are more secondary windings than primary windings. Therefore, the secondary current is smaller than the primary current. This way we can monitor or measure large currents using just a standard, small current, measuring devices. We usually connect the current transformer in a series. Voltage transformers are parallel connected and their usual role is to decrease the voltage. The decreased voltage is useful for running household objects. Also, like in the case of current transformers, it allows for standard measuring devices to monitor high voltage lines. In voltage transformers, there are more primary than secondary windings. Ideal Transformer Calculator can be embedded on your website to enrich the content you wrote and make it easier for your visitors to understand your message.